Rady Children's Hospital has a new no-opioid pain relief program. 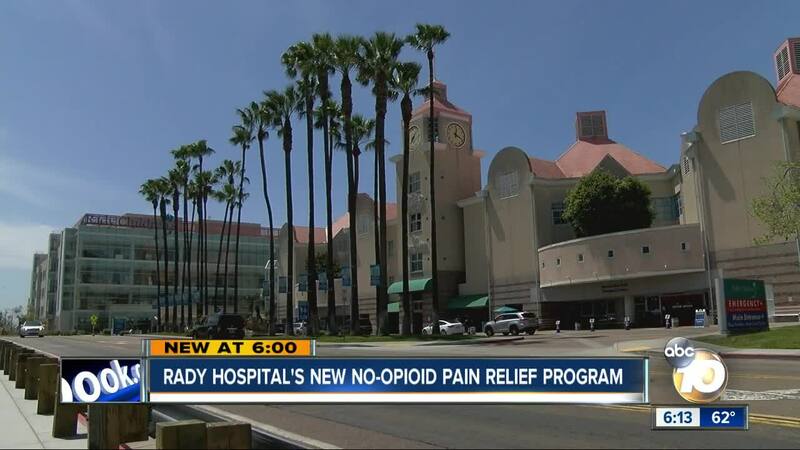 SAN DIEGO (KGTV)— Rady Children’s Hospital announced their partnership with Children's Specialized Hospital in New Jersey, to expand its opioid-free Pain Management Program. 10News met 17-year-old Jasper Neale at Rady Children's Hospital. Neale said in the summer of 2014, he was at a junior lifeguards camp at Moonlight State Beach in Encinitas. When he was running on the sand, he fractured his heel. His family thought it was a straight forward injury. But the pain started to spread everywhere, making him immobile. His x-rays showed recovery, but his pain was not going away. The injury puzzled locals doctors. "They kind of just said, ‘We're not sure.’ This is the weirdest thing I've ever seen,” Neale said. Their last hope was the Children's Specialized Hospital in New Jersey, where they had an advanced chronic pain management program. There, the specialists told him his diagnosis: complex regional pain syndrome. "You never take any drugs. You literally have nothing but yourself,” Neale said. Unlike traditional methods of pain relief, this program does not use any opioids. “People want a quick fix. The magic pill. The magic surgery to make everything get better, but most of the time, that's not available,” Andrew Skalsky, Division Chief of Rehabilitation Medicine at Rady Children’s Hospital, said. They have a tough love approach, combined with alternative therapies. "I came in being unable to walk, and the very next day, they forced you to run. They forced you to swim." “Unfortunately with a lot of chronic pain patients, they actually have to somewhat create more pain to make themselves better, but then also giving them the emotional and psychological tool kit to cope with that pain,” Skalsky said. Today, Rady Children’s Hospital announced they too will be adopting this program, so in the future, patients like Neale can get the treatment they need closer to home. For Neale, it was a seven-week treatment in New Jersey that fixed his chronic nerve pain. He came back to Encinitas, not hooked on drugs. There were no side effects. "From the day I left to now, I can do everything I want to do,” Neale said. Neale’s recovery led to the discovery of a new passion. The 6’8” senior at San Dieguito Academy is now a star volleyball player. In the fall, he will play for the University of Toronto. "Going from being completely dysfunctional, to being a fully functioning human, with only doing it through physical therapy and natural ways is amazing,” Neale said. Ready Children’s Hospital said this approach is not for all treatments. This one focuses solely on chronic pain.